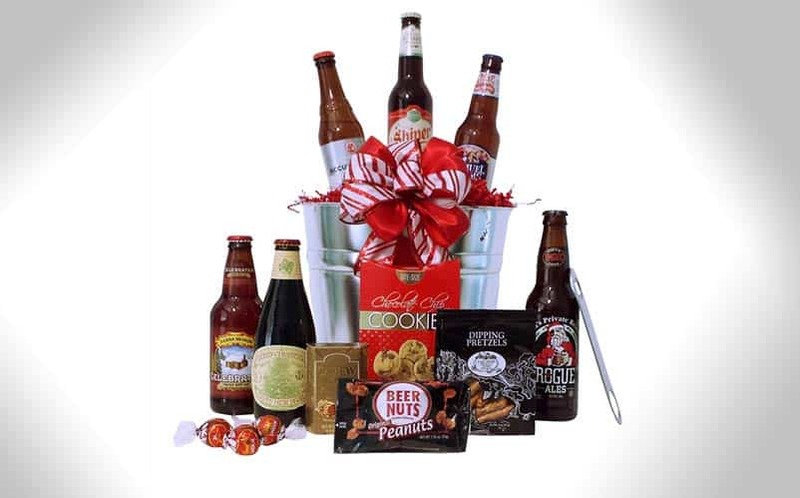 Santa's Private Reserve Craft Beer Gift Basket | Nerd Much? We don’t frequently talk about beer here at Nerd Much, unless it’s related to pop culture (like The Walking Dead beer, for instance). But let the record show that if there’s one thing we nerd about that we don’t talk about much on this website, it’s craft beer. Of course, we enjoy our beer in a nerdy way (like using the Untappd app on our phones to catalog all of our newly tasted brews). And, with the holiday season around the corner, one great gift this year is the Santa’s Private Reserve Craft Beer Gift Basket. It’s a collection of six of the best craft Christmas beers, including Santa’s Private Reserve by Rogue, Christmas Ale by Anchor Brewing, Celebration by Sierra Nevada, Cheer by Shiner, White Christmas by Samuel Adams, and Accumulation by New Belgium. The gift basket also comes with some great snacks, including East Shore Dipping Pretzels, Chocolate Chip Cookies, Lindt Lindor Chocolate Truffles, Cashew Roca Buttercrunch Toffee, and Beer Nuts. There are plenty of other beer gifts available at Givethembeer.com, and if they ever release a pop culture-themed selection, you’d better believe we’ll be all over it.